Iran’s team arrived at the opening ceremony of the 2016 Rio Paralympics at the Maracana stadium on Wednesday, with Eshrat Kordestani, the female Iranian sitting volleyball player, bearing the team’s flag in the white clothing of Hajj pilgrimage. 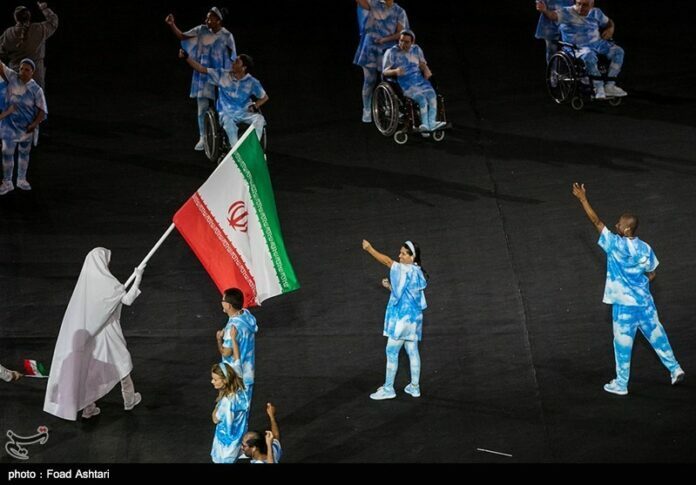 Iran’s Paralympics team, which is named after the victims of the deadly Mina stampede, attended the opening ceremony, as reported by Fars and translated by IFP. It was in this festive spirit that Iran’s 111 athletes made their debut, led by Kordestani in the white Ihram clothing. Each delegation, including independent Paralympic athletes, marched out with a puzzle piece, one side representing the country and the other with images of participating Paralympic athletes. As nations entered the stadium and the 1,160 puzzle pieces were assembled, they took the shape of a human heart. President of the Organizing Committee for the Rio 2016 Olympic Games Carlos Arthur Nuzman and International Paralympic Committee President Sir Philip Craven delivered speeches before acting President of the Republic of Brazil Michel Temer declared the Games open, Tasnim repored. The ceremony concluded with the lighting of the Paralympic cauldron by Brazilian Paralympic swimmer Clodoaldo Silva. A wheelchair user, Silva faced a flight of stairs between himself and the cauldron. The stairs transformed into ramps, allowing Silva to light the flame and prove – in a fitting message preceding 11 days of competition – that anything is possible.